There is no doubt that I consider myself a very proud Kurdish woman. Even despite the tiny size of my bedroom, I have a massive Kurdish flag covering my wall. I love the look of it and it just makes me feel safe that I have a country called Kurdistan. But as I discovered when I went to Iraqi Kurdistan to visit my family last year, that the reality of this can hurt. I was stopped at the airport and was not allowed into the country because I have a Syrian passport. I told them I was a Kurd like them and spoke Kurdish with them but they said that this was their policy towards all Syrians, even if they were Kurds. I felt like someone had slapped me in the face. I couldn’t believe it and was severely disappointed about the idea of Kurdistan, Kurds and the related bla bla. I kept telling them that I’m not leaving until I see my mother and that I couldn’t believe what they were saying about the procedures they had to follow to prevent their country from terrorist attacks. After many back and forth discussions, they finally let me in but held my passport at the border until I found a Kurdish person, specifically from Erbil and owning a house, to be my guarantor for 15 days. While I was waiting at the border, I saw another Kurdish young man trying to get in but he was forcibly sent back to Germany where he came from, as he didn’t have a visa for Iraqi Kurdistan. Before traveling to the Kurdish land, I asked the Iraqi embassy in London about visas to Kurdistan. They told me to just go and that they will give me the visa on arrival. It was clearly much harder than it sounded. I spent 20 days in Kurdistan, 15 days of which were spent worrying about my passport and how to find a guarantor. I was living among them but it felt like looking for water in a vast desert. Luckily In the end, I found a nice woman to take on this role for me. We traveled together in a taxi on the way to the Home Office. She spoke to me the whole way in Sorani, which I barely understand as I speak Kurmanji, which is another Kurdish dialect. That wasn’t as uncomfortable as her constant advising that I cover my hair though, as well as to pray and do Ramadan to be a good Muslim. She didn’t know me at all; yet, she was advising me like she was my mother, or more. She was a very nice woman despite all that, and at the end of the day she was the most helpful person I met in Erbil during the entire trip. When the Kurdistan Regional Government was officially created in 2005, my family like all other Kurds were very excited, it was like a dream come true. Back then, my father said it would be no time before we all move and live in Kurdistan, the dream of all the Kurds, where we will all be allowed to speak, write, study and sing in Kurdish with no differences between where you came from. It would be enough to be a Kurd. Kurds all belong to Kurdistan because as far as I am aware, it’s supposed to be one country. The reality is that I am simply not allowed to enter Kurdistan because I don’t belong to that part of the Kurdish speaking land, or at least that’s what I learned from my trip. It is very confusing but maybe we shouldn’t be too romantic about the whole idea of Kurdistan, and just accept the fact that politicians need to be realistic and careful to build a strong, independent Kurdish state. 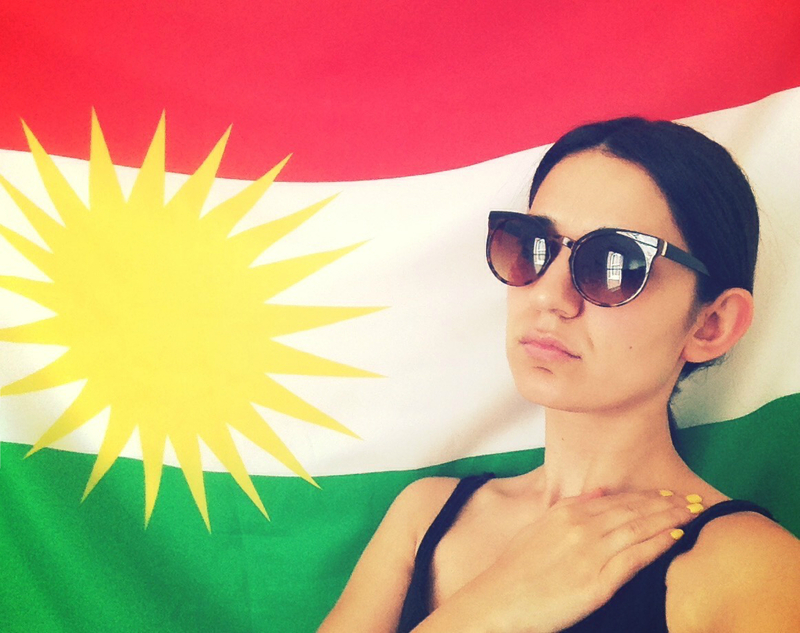 While that all sounds fair, it feels so wrong to stand at a Kurdish border control trying to prove that I am not going to harm this nation when I have admired it since I was a very little girl, singing at a secret Kurdish theater for years and risking everything for the sake of Kurdistan. As they say, little things matter. For me, one smiley welcome from the border police would have changed my entire trip to Erbil into an amazing memory. Why all these differences? We need to see more tolerance and scenes such as when the Pêshmerga and the YPG freed Kobani from ISIS, hand in hand, reminding us that at the end of the day, we all have the same core love for the same people. Posted in Opinion and tagged #Kurds #Kurdistan #Peshmarga #IraqiKurdistan. Bookmark the permalink.